Our Life on a Budget...: Our first hurricane??? My thoughts... oh this might be happening. The parish I work in likes to stay ahead of the game... we knew by 2 that school was cancelled through Wednesday (goodbye Thanksgiving Break???) and that St. Charles Parish had a mandatory evacuation. We waited all day Sunday for a report from the seminary.... and heard nothing. To go or not to go... that was the question. We couldn't figure out what we should do. On Monday we were supposed to see the doctor for an update on baby Skelton, but did not want to get in all the crazy traffic if the announced a mandatory evacuation. Finally we decided to start packing (at like 10 pm... so late for me) get up early in the morning, watch the news and make a decision. Well, we got up early yesterday, and still couldn't make a decision, and we still had not heard an announcement from the seminary. We were able to move up our doctor appointment to 9:45 and decided to pack up to leave right after that. Even while we were sitting at the doctor's office we were asking, "Do we really want to leave?" Finally even though we hadn't heard anything fom the seminary we said let's take a "hurrication" and see some family and friends. While we were on the road we heard that the seminary was going to be closed Tuesday-Thursday. I think we made the right decision to go ahead and go, I heard many left after work Monday, so traffic was bad... and better safe than sorry! We headed out yesterday about 1 in the afternoon, and spent last night and Tuscaloosa with Andrew's grandfather and aunt. This morning I go to eat breakfast with Alana, a friend from college that works at the university with her husband ministering to college students. What other fun things will this "hurrication" hold??? I am not sure, but hopefully we will have some fun things to report :). 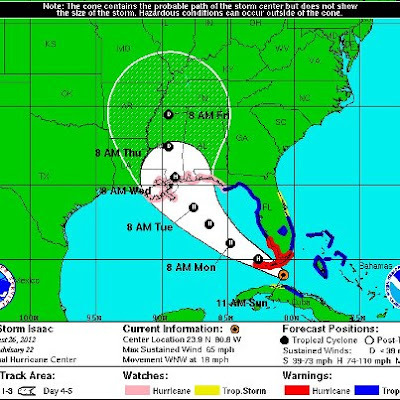 We are praying that the impact of Issac is minimal and that are friends that are sticking out the storm stay safe.